Hollywood tragedies… but it’s also a reminder that the true value of a person rests not in the manner of their death, but in the way they lived their life and continue to touch the lives of the people of who knew them. That’s really the focus of Pete Duel: A Biography, a fascinating new book by Paul Green that Frankie and I talked about last week on TV Confidential.In case you missed it, our interview with Paul is now available on our archives page at www.tvconfidential.net. The program also features film and television actress Kim Darby, who not only co-starred with Pete Duel in the film Generation but was among the actor’s closest friends. Author’s Holiday Give-Away Is Back!! It was so much fun last year, I have to do it again!! Everyone who purchases a copy of my novel “Save Them All,” directly from author (address below) or through PayPal will be entered in my “Author’s Holiday Give-Away” drawing for the goodie basket below. The winner will receive a green and gold harvest basket filled with a blue plaid fleece throw, a crazy cute pink poodle, an over-sized mug with Sen-Cha tea, a happy snowman, festive reindeer hand towel, a spiral “fat book” for note taking, a wildlife print pen, an aquamarine cushion grip pen, some sweet treats and a signed copy of my novel, “Save Them All” with wildlife bookmark to gift one of your favorite people. The contest begins on Monday, September 22, 2008 and will end midnight on December 10, 2008 when the winning name will be drawn. 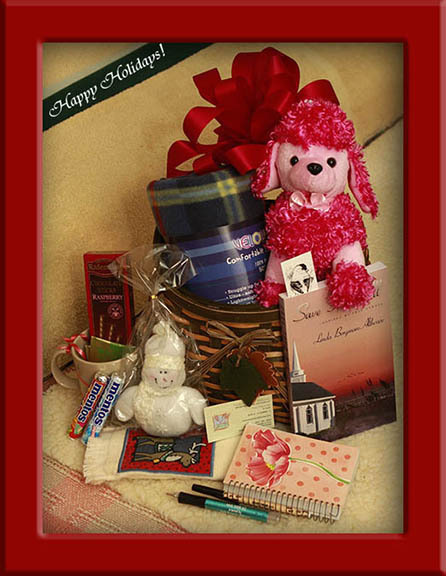 The winner will be notified by email on December 11, 2008 to let her or him know their prize basket is in the mail. ENTER!! It’s definitely a lot of fun for me, you receive a GREAT read that has created “Colbi Moment” fans in pockets all over the states (& UK, Denmark & Zimbabwe), and I still believe your ODDS of snagging this basket and it’s goodies are much better than powerball, your state’s lottery or even a scratch off card!! Just ask Bea B., last years winner. Good Luck and have Happy & Safe Holidays!! Best known for playing Hannibal Heyes on the 1970s Western series Alias Smith and Jones, Pete Duel was a talented but troubled young actor who took his life at the height of his celebrity. What makes this book stand apart from other Hollywood biographies is that it is an earnest psychological study of Duel’s life that also comments on the human condition. Author Paul Green will be one of the guests on my program on Tuesday, Oct. 7. Also written by Paul Green, this book is a comprehensive look at television’s first 90-minute Western series, The Virginian, based on the classic 1902 novel by Owen Wister. I haven’t started this yet, but from what I’ve heard about it, I’m very much looking forward to reading this candid memoir by former child star Wil Wheaton (Stand By Me, Star Trek: The Next Generation). The life and career of Raymond Burr will be the subject of the next edition of Talking Television with Dave White, this Tuesday, July 10, beginning at 10:30pm ET, 7:30pm PT on Share-a-Vision Radio, KSAV.org. Whether you knew him as Perry Mason, Robert Ironside or the many movie villains he played (including Lars Thorwald in Alfred Hitchcock’s Rear Window), Raymond Burr was a powerful presence on television for over 40 years. But offscreen, he was something of an enigma. We’ll unwrap the mystery that was Burr with our guest Michael Seth Starr, author of “Hiding in Plain Sight: The Secret Life of Raymond Burr,” a compassionate look at the life and career of this TV icon. If you’re a fan of Raymond Burr, if you grew up watching Perry Mason and/or Ironside, we invite you to join guest hosts Ed Robertson and Frankie Montiforte beginning at 10:30pm ET, 7:30pm PT on KSAV.org. What’s your favorite Raymond Burr movie role or TV series? Let us know and tell us why. Phone number is (800) 407-KSAV (5728), email address is talk@ksav.org or ed@talkingtelevision.org.